Written Test of the recruitment process is scheduled to be held from 10 am to 1 pm, on 30th September 2018 (Sunday) throughout the State. All the Candidates who have successfully uploaded their Applications are informed that the Hall Tickets for Preliminary Written Test (PWT) can be downloaded from 8 am on 20th September onwards till 12 midnight on 28th September 2018 by logging into their respective accounts on the TSLPRB website: www.tslprb.in by entering their credentials. Candidates whose Hall Tickets could not be downloaded may send e-mail to support@tslprb.in or contact us on 93937 11110 or 93910 05006. After downloading the Hall Tickets, Candidates shall take a printout of the same,preferably on A4 size paper on both the sides (so that the Hall Ticket is available on a single sheet paper). Though it is not mandatory to take the printout in colour, printout taken in colour nevertheless provides better visibility when compared to monochrome (black and white) printout. denied to such Candidates who come to the Examination Centres without proper Hall Tickets. The Preliminary Written Test (PWT) for SCT PC Civil and / or Equivalent recruitment PWT is scheduled to be conduct exam on 30th September 2018 Sunday, 10 AM to 1 PM The revised hall tickets available to download now . 1. TSLPRB-Telangana State Level Police Recruitment Board O/o The Director General Of Police, Telangana, Hyderabad, DGP Telangana, TSLPRB has given the Police Constable Posts 2018 Recruitment notification on 31-05- 2018. 2. Applications are invited through ONLINE mode only in the prescribed proforma to be made available on WEBSITE (www.tslprb.in) from 09-06-2018 to 30-06-2018 for recruitmentto the following posts. 3.The registered candidates may download their Hall Ticket one week before the date of Preliminary Written Test, which will be scheduled on 30th September 2018 Sunday, 10 AM to 1 PM. 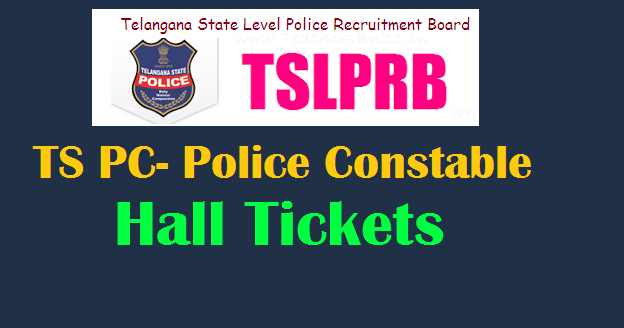 #TSLPRB Police Constable Posts 2018 Hall Tickets.